Classic television of the 60s gave us a number of TV shows where cars were a central or major supporting element. 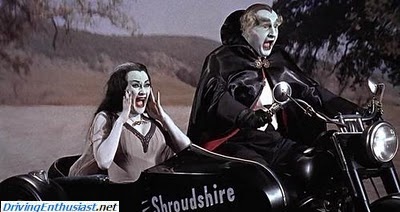 Two of the most famous and well known were from the situation comedy “The Munsters”: the Munster Coach and Dragula. Both were built by George Barris and were probably the coolest TV cars of their age. And who else could have built them? 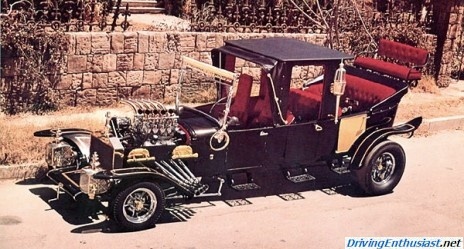 Barris was the king of customizers in the 60s. 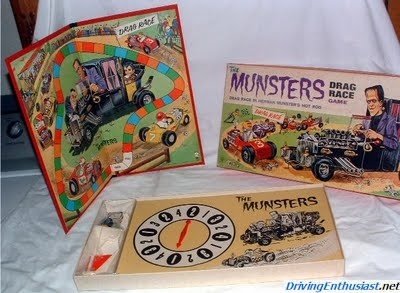 The definitive website of the Munster cars is here: http://www.munsterkoach.com. Update: replica Munster coach startup and run by Herman himself. The Munster Coach was the family vehicle, carrying the family on their trips. Where did they go? All the same places any normal family would, and probably a few more (tar pits, bat caves, graveyards, ghost towns). Of course Herman also used it to get to his job at the local funeral parlor – euphemistically referred to as the “parlor”. Whatever tasks it was that he did there certainly couldn’t be mentioned on the air in the 60s! 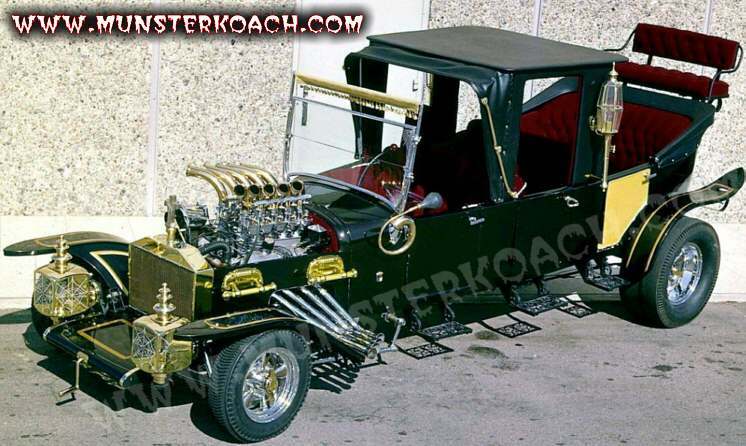 Dragula was Grandpa’s car, but was usually driven by Herman. 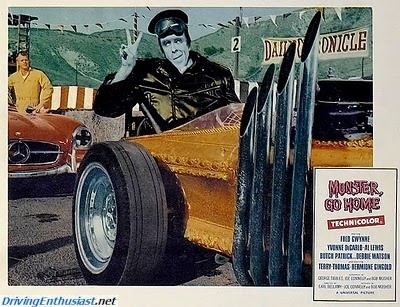 It was first seen in the original film Munster Go Home (where Herman raced it on back roads in England) and then became a supporting prop (unfortunately rarely seen) for the remaining year of the television show. 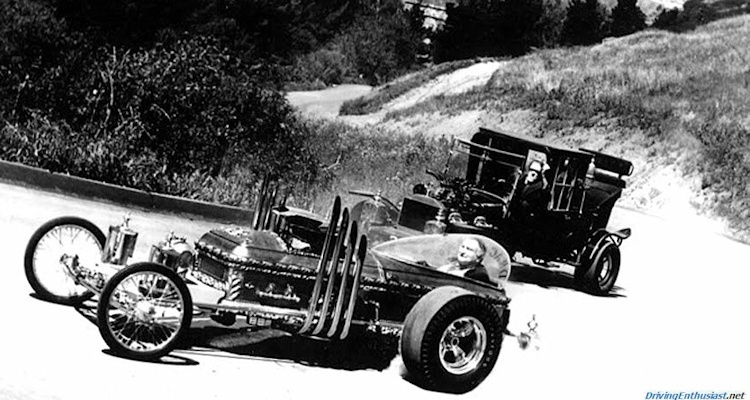 The design of the car was basically a dragster (very hip in the 60s), done up in great style by George Barris, and based on – what else – a coffin. The car survived and is hanging over a bar in Chicago. A duplicate was even offered on eBay a couple of years ago. In the ’60s, every town had a drag strip (of course) – even Mockingbird Heights. There are many funny stories about the filming. 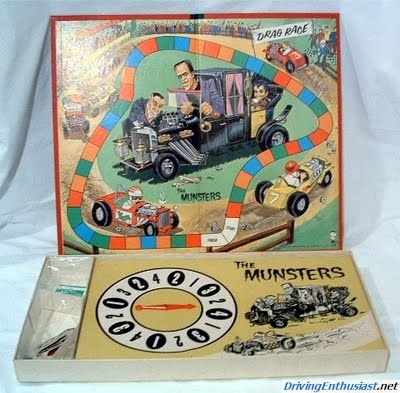 One of the best surfaced years later after the show went off the air: the day the actors in full costume took the Munster Coach on a unplanned (and unauthorized) joyride around Los Angeles. No cameras, no publicity, and the studio didn’t even know about it. The city just about shut down at the sight of them. 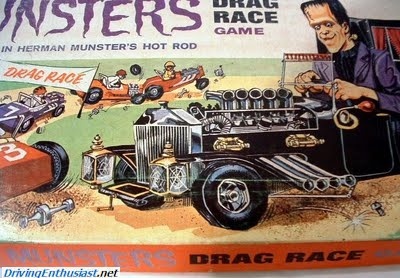 The Munsters was a great show and every kid we knew watched it no matter what. However, CBS cancelled it after three years in a strategy literally intended to raise the level of sophistication of the network. We’re sure that very few people missed Green Acres – but we do miss The Munsters. 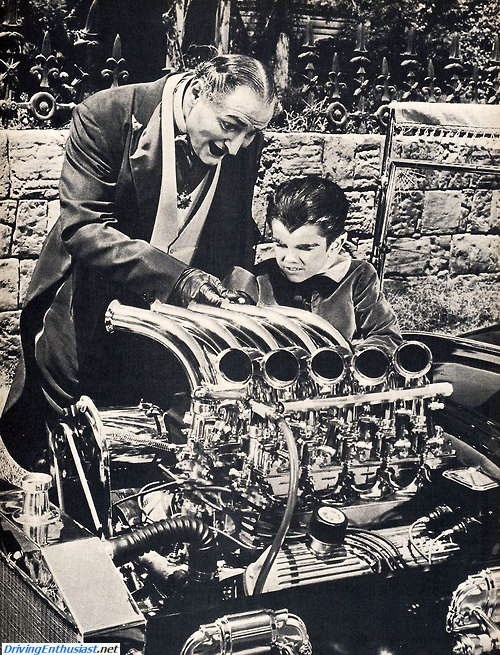 The Munsters was the 60s, and it got a lot of kids like ourselves interested in cool cars. What could be better than an early morning run thru the hills above L.A.? Grandpa shows Eddie how the Munster Coach works. What California kid wouldn’t want to know all about engines? Odd: why 10 intake tubes on a V-8?